I departed home for the slope in a light rain this morning. My wife clearly thought I was crazy to ski in the rain. Regardless, I still thought it could be a good day in spite of the weather. I arrived to an empty ski lodge! Nary a geezer buddy was there. Oh well, get the gear on and prepare for the day. In anticipation of the wet conditions I brought out the old yellow ski jacket that although a Gore Tex jacket, it had long ago lost the resistance to rain. However, I had recently given it a silicone waterproof spray treatment with the hopes of restoring water proofing. By 9:30 I was on the lift being the only person other than the ski patrol in attendance. The top of the hill was cloaked in fog and the rain was spattering my goggles. Having the hood of my jacket up kept the water from running down my neck. For the first half hour or so, I managed to "enjoy" a run or two attempting to see the snow surface through the fog and rain. A bit bumpy, but skiable. 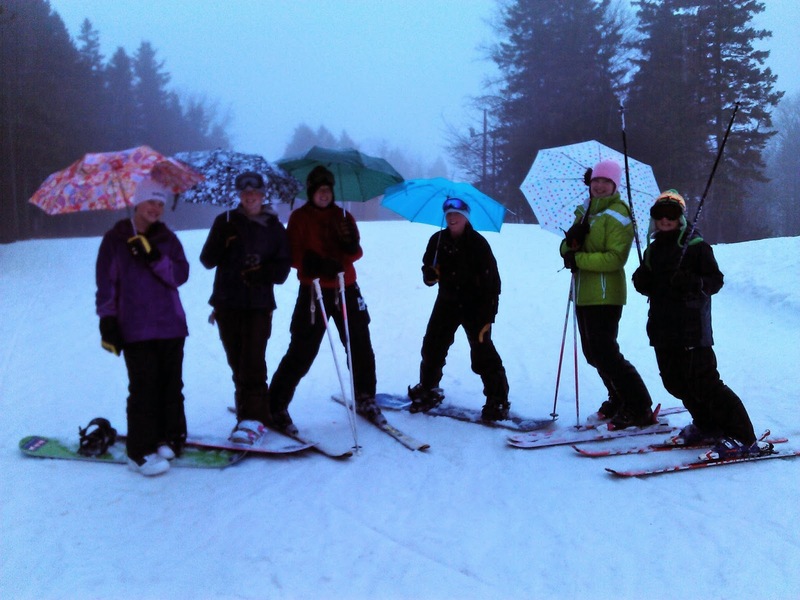 A little later in the morning I was treated to an unexpected encounter with a bevy of young umbrella carrying lady skiers and boarders. I greeted them at the top of the slope and asked the inevitable question, "What are you doing here on this rainy day?" They were happy to inform me that they were attempting to set a record of consecutive days of skiing this season. And this was day 54. Their enthusiasm for the day was infectious. We chatted for a few moments and they were pleased to let me take their picture. (Picture below is with my phone camera. Sorry about the poor quality.) The smiles on these fresh young faces says it all. There is joy to be had in all things. Even on a wet and foggy day on the slopes. They even wanted a picture of this old geezer with them that was taken by the lift attendant. After my encounter with the young group, I skied but a few more runs and then decided the rest of the morning would be better spent with a long coffee break. The so-called waterproof jacket was beginning to soak through and even though my waterproof ski bibs rarely leak, today they also failed. Usually there is gaggle of geezers gathering for coffee. Not so today. So I took the liberty of calling a Greek Peak area resident geezer to invite him for coffee. He was wise enough to stay dry but was willing to join me for break. Thanks, Larry! After an enjoyable exchange of pleasantries it was time to go home and dry out. In the parking lot a young man just arriving asked, "How's the skiing?" I replied at always, "Not too bad. A bad day of skiing is a good day to be alive."